Invite Collection 5-Light Antique Bronze Chandelier Invite provides a welcoming silhouette with a unique shade comprised of an inner glass globe encircled by a translucent sheer Mylar shade. The rich, layering effect creates a dreamy look that is both elegant and modern. Offered as a complete collection, the Invite styling can be carried throughout your home or as a focal style in a special room. 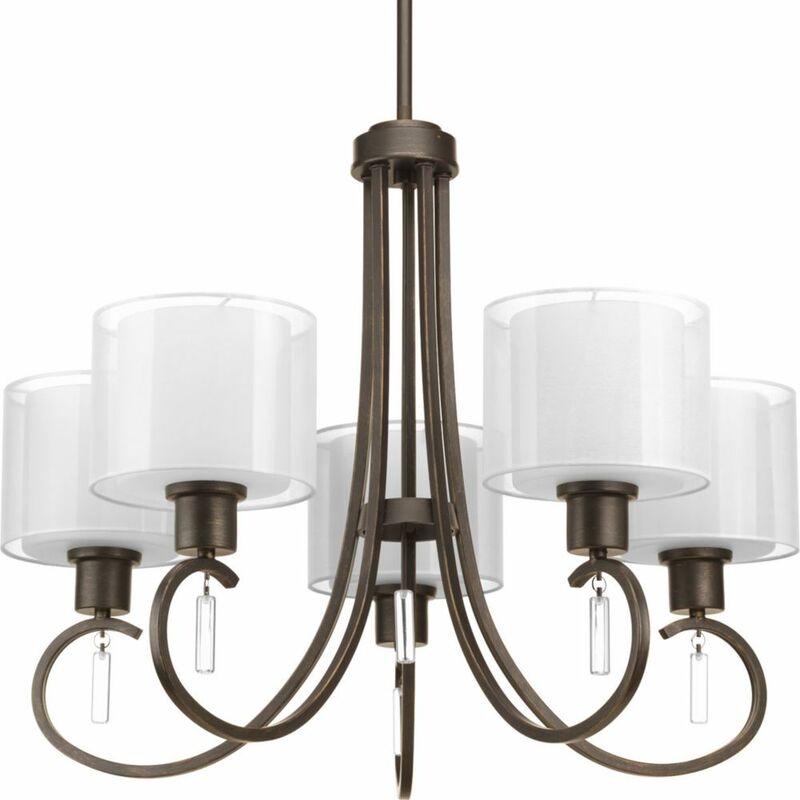 Invite Collection 5-Light Antique Bronze Chandelier is rated 5.0 out of 5 by 5. Rated 5 out of 5 by HomeDepotCustomer from One of the dangles was missing. I called and they... One of the dangles was missing. I called and they sent a pack ASAP. The light looks great! Rated 5 out of 5 by Jan from Looks great, gives plenty of light. One crystal was... Looks great, gives plenty of light. One crystal was broken in shipping so I elected to leave them off. Rated 5 out of 5 by Cheri from Bedroom beautiful We bought this light for our newly renovated bedroom and it was the icing on the cake. Rated 5 out of 5 by SBM from This light is very simple/classic and looks beautiful in the room. It is bright enough with 5 li... This light is very simple/classic and looks beautiful in the room. It is bright enough with 5 lights but the light is not glaring due to the white screens that are placed over the glass fixtures. Love the look of this light! Rated 5 out of 5 by Anonymous from Beautiful transitional chandelier We love how this chandelier looks hanging over our dining table...Absolutely stunnning in any space!